SHOP EARLY & Get Dibs on the Best Selection! WHY SHOP THE PRESALE? Shopping the presale gets you the biggest selection of items at the best deals! The earlier you shop, the better the deals. Please note: Passes are required for all Presales and Kids are welcome during ALL Presale and Open to Public shopping times. Please use caution as the Presales and 1st day open to public can be overwhelming. Children worn or in strollers/wagons are best. Children must stay with the parent at all times, please. Team Member and Consignor Passes are distributed at Drop Off. Team Members: You get to shop first! The more you help, the earlier you shop! In addition, all Team Members receive one friend pass and those who work a 4 hour shift at the sale receive an additional 5% profit on all consigned items. Team Members who volunteer 12-16+ hours at the sale get early admission for our 50% off presale. Consign: All consignors receive a presale pass for themselves and one friend pass. Prime Time Shopping on Thursday for presale. There is a $10 fee per person and a limited # of tickets available. Prime Time shopping is designed for folks who may not qualify for one of our free presales or who just wants to get dibs on the best stuff a little earlier! First Time Parents and Grandparents: If you are expecting your first child or grandchild or have had your first child or grandchild in the last 12 months, you qualify! There is no cost to attend however pre-registration is required - You are allowed one guest. Sorry, if you have shopped early as a First Time Parent/Grandparent previously, you may not sign up to shop early again..But you can shop at primetime shopping time with a ticket! 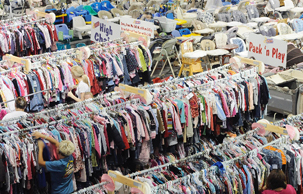 Or now with a little one, you can sign up to consign to sell childs outgrown items and/or volunteer you get to shop 1st before the public! At the Fresno Sales Event, we love helping area associations and groups by being a fundraising partner! Sign up for our fundraising with JBF and your group can sell at our next event and not have to do anything but collect items to sell, no garage sales to set up, just drop off and our Valet Service does the rest! EMAIL MANDI for more info or questions! Promote your business with JBF! Want to grow your business! Is your target market MOMS or YOUNG FAMILIES? If YES, JBF is the place you need to be! 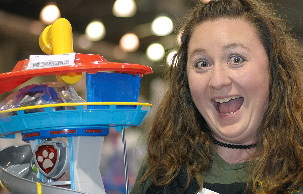 Get your business or products in front of 5,000 + shoppers at our sale. JBF customers are SMART and SAVVY parents and grandparents who not only know a good deal but also make wise choices for the children in their lives. Why not let them know about your business? We have several ways that you can be apart of our event and promote your business. Swag bags, giveaways, vendor booths and sponsorship options! Contact us to tell us about your business and to see how we can partner! See how great JBF families are for your business! Q: Where is your sale? Q: Is there an admission fee? TIP: Bring a shopping list and know your kids clothing and shoe size. Q. Who can consign their items and become a seller? A. 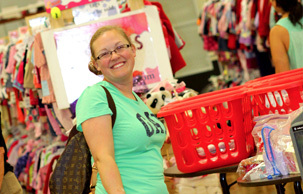 Anyone can consign their children's and maternity items with Just Between Friends. A. Yes, consignors will shop early on a designated pre-sale day . You are given a consignor presale pass and one guest pass during consignor drop off. You must have a presale pass to enter the pre-sale. A.JBF has made the decision to allow kids during ALL Presale and Open to Public shopping times. Please use caution as the Presales and 1st day open to public can be overwhelming. Children worn or in strollers/wagons are best. Children must stay with the parent at all times, please. Q. What percentage of the sales do I receive? A. Consignors receive 65% of their sales less a $15.00 consignor fee (deducted from your check). Want to earn 70%? All you need to do is complete one 4 hour Team Member shift during the sale or participate in one of our barters prior to the sale. A. You set your own price and you get to decide if it is discounted on our half-price day. We recommend pricing at 30-90% of what you paid for the item. Remember for clothing the minumum price is $3.00. You can combine items that are the same size together. Q. What percentage of my items can I expect to sell? A. Most sellers sell approximately 80% of their clothing items in sizes 2-10. For sizes under 24 months the percentage drops due to the sheer volume of merchandise received. People also tend to receive infant clothing as gifts, hand me downs etc. The older sizes (12-16 and up) seems to be on the rise. We are always in need of more pre-teen / teen items. A. Just click on our "Log In" button and fill out the form. You will recieve an email confirmation within moments. .Q. How long should I schedule for drop off? A. Typically takes about 45-60 minutes to drop off your items. There will be people around to help direct you where to place them in the designated areas around the sales floor. It is helpful to bring a wagon to drop off your items.Dropping off at the last minute will lead to long lines and longer waiting. A. During drop off times listed on consingor details page. A. Unsold items are to be picked up after the sale has ended and all remaining items have been sorted. You are allowed to pick up your unsold items only during designated times. See Consignor details page for times. Everything not picked up on time will automatically be donated to our chartiy partner. A. No, when you pick up your unsold items, your hanging garments will already be sorted by Consignor # for easy pickup. A. Your check will be mailed to you approximately fourteen work days after the end of the sale, sometimes much sooner! A.Our online barcoding system will have all the information you need. Items that have sold will be uploaded each night. Realize that sometimes the sale runs really late and tags may not be uploaded until the next day. You can check the communication box at the top of the tagging site. Also note, some items that have to be manually entered may not show up sold online, but will be paid in your check. A. We accept anything related to babies, children or maternity. The clothing must be current season. Other great items are toys, books, videos, strollers, baby equipment, nursery items, large play equipment, bedding, cribs, changing tables, household furniture, etc. Please be sure that your items are in great shape. Each item will be inspected prior to entrance. Q. What about shoes? A. Shoes are allowed, but please bring only your best shoes. These items are easily worn out and will not sell if they are worn. The best sellers are dress shoes, new shoes, good brand shoes and shoes that complete an outfit.